The (contraction of Geheime Staatspolizei: "Secret State Police") was the official secret police of Nazi Germany. Beginning in April 1934, it was under the overall administration of the Schutzstaffel under Heinrich Himmler in his position as leader of the SS and Chief of German Police (Chef der Deutschen Polizei). From September 1939 forward it was administered by the Reichssicherheitshauptamt (RSHA) ("Reich Main Security Office") and was considered a sister organization of the Sicherheitsdienst (SD) ("Security Service") and also a suboffice of the Sicherheitspolizei (SIPO) ("security police"). As part of the deal in which Adolf Hitler became Chancellor of Germany, Hermann Göring (future commander of the Luftwaffe and an influential Nazi Party official) was named as Interior Minister of Prussia. This gave him command of the largest police force in Germany. Soon afterward, Göring detached the political and intelligence departments from the police and filled their ranks with Nazis. On April 26, 1933 Göring merged the two units as the Gestapo. He originally wanted to name it the Secret Police Office ( ), but discovered the German initials "GPA" would be too similar to the Soviet GPU. Its first commander was Rudolf Diels, a protégé of Göring. Diels was best known as the primary interrogator of Marinus van der Lubbe after the Reichstag fire. The Reich Interior Minister, Wilhelm Frick, wanted to integrate all the police forces of the German states in late 1933. Göring outflanked him by removing the Prussian political and intelligence departments from the state interior ministry. Göring himself took over the Gestapo in 1934 and urged Hitler to extend the agency's authority throughout Germany. This represented a radical departure from German tradition, which held that law enforcement was (mostly) a Land (state) and local matter. In this, he ran into conflict with Heinrich Himmler, who was police chief of the second most powerful German state, Bavaria . Frick did not have the muscle to take on Göring himself so he allied with Himmler and Heydrich. With Frick's support, Himmler (pushed on by his right hand man, Heydrich) took over the political police of state after state. Soon only Prussia was left. On 20 April 1934 Göring and Himmler agreed to put aside their differences (largely because of mutual hatred and growing dread of the Sturmabteilung ) and Göring transferred full authority over the Gestapo to Himmler, who was also named chief of all German police forces outside Prussia. Himmler on 22 April 1934 named Heydrich the head of the Gestapo. Himmler was later named the chief of all German police on 17 June 1936. At that point, the Gestapo was incorporated into the SIPO or Sicherheitspolizei with the Kripo or Kriminalpolizel (Criminal Police) and considered a sister organisation of the SD or Sicherheitsdienst. Reinhard Heydrich was head of the SIPO (Gestapo & Kripo) and SD.Heinrich Müller, was the chief of operations of the Gestapo. He answered to Heydrich. Heydrich answered only to Himmler. The merger of the SS and Gestapo effectively removed it from the oversight of Frick, who as interior minister would have normally been Himmler's superior. Therefore, Himmler answered only to Hitler. The Gestapo had the authority to investigate treason, espionage and sabotage cases and cases of criminal attacks on the Nazi Party and Germany . The basic Gestapo law passed by the government in 1936 gave the Gestapo carte blanche to operate without judicial oversight. The Gestapo was specifically exempted from responsibility to administrative courts, where citizens normally could sue the state to conform to laws. As early as 1935, however, a Prussian administrative court had ruled that the Gestapo's actions were not subject to judicial review. Werner Best, Himmler's right-hand man with the Gestapo, summed up this policy by saying, "As long as the police carries out the will of the leadership, it is acting legally. "A further law passed later in the year gave the Gestapo responsibility for setting up and administering concentration camps. 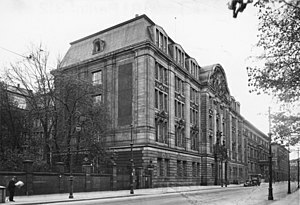 In September 1939 the security and police agencies of Nazi Germany were consolidated into the Reich Main Security Office (RSHA ), headed by Heydrich. The Gestapo became Amt IV (Department IV) of RSHA and Müller became the Gestapo Chief, with Heydrich as his immediate superior. After Heydrich's assassination in 1942, Ernst Kaltenbrunner became head of RSHA, and Müller remained the Gestapo Chief, a position he occupied until the end of the war. Adolf Eichmann was Müller's direct subordinate and head of Department IV, Section B4, which dealt with Jews. The power of the Gestapo most open to misuse was called Schutzhaft – "protective custody", a euphemism for the power to imprison people without judicial proceedings. An oddity of the system was that the prisoner had to sign his own Schutzhaftbefehl, an order declaring that the person had requested imprisonment – presumably out of fear of personal harm (which, in a way, was true). In addition, thousands of political prisoners throughout Germany – and from 1941, throughout the occupied territories under the Night and Fog Decree – simply disappeared while in Gestapo custody. During World War II, the Gestapo was expanded to around 46,000 members. By February and March, 1942, student protests were calling for an end to the Nazi regime. These included the non-violent resistance of Hans and Sophie Scholl, two leaders of the White Rose student group. However, resistance groups and those who were in moral or political opposition to the Nazis were stalled by the fear of reprisals from the Gestapo. In fact, reprisals did come in response to the protests. Fearful of an internal overthrow, the forces of Himmler and the Gestapo were unleashed on the opposition. The first five months of 1943 witnessed thousands of arrests and executions as the Gestapo exercised their powers over the German public. Student opposition leaders were executed in late February, and a major opposition organization, the Oster Circle, was destroyed in April, 1943. Nevertheless, some Germans did speak out and show signs of protest during the summer of 1943. Despite fear of the Gestapo after the mass arrests and executions of the spring, the opposition still plotted and planned. Some Germans were convinced that it was their duty to apply all possible expedients to end the war as quickly as possible; that is, to further the German defeat by all available means. The Gestapo cracked down ruthlessly on the dissidents in Germany, just as they did everywhere else. During June, July and August, the Gestapo continued to move swiftly against the opposition, rendering any organised opposition impossible. Arrests and executions were common. Terror against the people had become a way of life. A second major reason was that the opposition's peace feelers to the Western Allies did not meet with success. This was part because of the aftermath of the Venlo incident of 1939, when SD and Gestapo agents posing as anti-Nazis in the Netherlands kidnapped two British Secret Intelligence Service (SIS) officers lured to a meeting to discuss peace terms. That prompted Winston Churchill to ban any further contact with the German opposition. In addition, the British and Americans did not want to deal with anti-Nazis because they were fearful that the Soviet Union would believe they were attempting to make deals behind the Soviets' back. Between November 14, 1945 and October 3, 1946, the Allies established an International Military Tribunal (IMT) to try twenty-two of twenty-four major Nazi war criminals and six groups for crimes against peace, war crimes and crimes against humanity. Nineteen of the twenty-two were convicted. At this time the Gestapo was condemned as a criminal organisation. Leaders, organisers, instigators and accomplices participating in the formulation or execution of a common plan or conspiracy to commit the crimes specified were declared responsible for all acts performed by any persons in execution of such plan. The official positions of defendants as heads of state or holders of high government offices were not to free them from responsibility or mitigate their punishment; nor was the fact that a defendant acted pursuant to an order of a superior to excuse him from responsibility, although it might be considered by the IMT in mitigation of punishment. At the trial of any individual member of any group or organisation, the IMT was authorised to declare (in connection with any act of which the individual was convicted) that the group or organisation to which he belonged was a criminal organization. When a group or organization was thus declared criminal, the competent national authority of any signatory had the right to bring persons to trial for membership in that organisation, with the criminal nature of the group or organisation assumed proved. These groups – the Nazi party and government leadership, the German General Staff and High Command (OKW); the Sturmabteilung (SA); the Schutzstaffel (SS), including the Sicherheitsdienst (SD); and the Gestapo – had an aggregate membership exceeding two million, making a large number of their members liable to trial if the organisations were convicted. The trials began in November, 1945. On October 1, 1946 the IMT rendered its judgement on twenty-one top officials of the Third Reich: eighteen were sentenced to death or to extensive prison terms, and three acquitted. The IMT also convicted three of the groups: the Nazi leadership corps, the SS (including the SD) and the Gestapo. Gestapo members Hermann Göring and Arthur Seyss-Inquart were individually convicted. Three groups were acquitted of collective war crimes charges, but this did not relieve individual members of those groups from conviction and punishment under the denazification programme. Members of the three convicted groups were subject to apprehension by Britain , the United States , the Soviet Union and France . Moreover, even though individual members of the convicted groups might be acquitted of war crimes, they still remained subject to trial under the denazification programme. In 1997 Cologne transformed the former regional Gestapo headquarters in that city – the EL-DE Haus – into a museum to document the organization's actions. From its conception the Gestapo was a well established bureaucratic mechanism, having been created from the Prussian Secret Police. In 1934 the Gestapo was transferred from the Prussian Interior Ministry to the Reich Interior Ministry. However, it was only nominally under the control of the Interior Ministry with actual control by the SS. Over the next five years the Gestapo underwent considerable expansion, and in 1936 combined with the Kripo to form the SiPo, Sicherheitspolizei (Security Police). In the fall of 1939 the SIPO (made up of the Gestapo and Kripo) together with the SD were all placed under the authority of the Reichssicherheitshauptamt (RSHA), the Reich Main Security Office, all under Heydrich until his death in 1942. Within the RSHA the Gestapo was known as Amt IV ("Dept. or Office IV") with Müller the Chief. The internal organization of the group is outlined below. The Central Command Office of the Gestapo, formed in 1941. Before 1939 the Gestapo command was under the authority of the office of the Sicherheitspolizei und Sicherheitsdienst (SD). However, the SD envied the power of the Gestapo and the Gestapo did not care for what it saw as interference from SD agents. Later after September 1939 the Gestapo was run directly through the overall command of the RSHA. However, after Heydrich's death in June 1942, and as the war progressed, Müller's power and the independence grew substantially. This trickled down the chain of his subordinates, such as the commanding general of this office. It led to much more independence of action. The local offices of the Gestapo, known as Stapostellen and Stapoleitstellen, answered to a local commander known as the Inspekteur der Sicherheitspolizei und des SD ("inspector of the security police and security services") who, in turn, was under the dual command of Referat N of the Gestapo and also his local SS and Police Leader. The classic image of the Gestapo officer, dressed in trench coat and hat, can be attributed to Gestapo offices in German cities and larger towns. This image seems to have been popularized by the assassination of the former Chancellor General Kurt von Schleicher in 1934. General von Schleicher and his wife were gunned down in their Berlin home by three men dressed in black trench coats and wearing black fedoras. The killers of General von Schleicher were widely believed to have been Gestapo men. At a press conference held later the same day Hermann Göring was asked by foreign correspondents to respond to a hot rumour that General von Schleicher had been murdered in his home. Göring stated that the Gestapo had attempted to arrest Schleicher, but that he had been "shot while attempting to escape". The Gestapo also maintained offices at all Nazi concentration camps, held an office on the staff of the SS and Police Leaders, and supplied personnel as needed to formations such as the Einsatzgruppen . Personnel assigned to these auxiliary duties were often removed from the Gestapo chain of command and fell under the authority of branches of the SS. Before their amalgamation into the RSHA, the Gestapo and Kripo were plainclothes police agencies and had no uniforms. Although individual Gestapo members could and did join the Allgemeine-SS or other Party organizations, those uniforms would not have been worn on duty. RSHA personnel did not wear the "SS" collar runes depicted here. In June 1936, a concerted effort was made to recruit policemen of the SiPo into the SS, and SS personnel into the Kripo and especially the Gestapo. With the formation of RSHA in September 1939, Gestapo officers who were also SS members began to wear the wartime grey SS uniform when on duty in the Hauptamt or regional headquarters (Abschnitten). Hollywood notwithstanding, the sinister black uniform was only worn after 1939 by Allgemeine-SS reservists; it was abolished in 1942. Outside the main offices Gestapo agents continued to wear civilian suits in keeping with the secret, plainclothes nature of their work. There were in fact very strict protocols protecting the identity of Gestapo field personnel. In most cases, when asked for identification, an operative was only required to present his warrant disc. This identified the operative as Gestapo without revealing personal identity and agents, except when ordered to do so by an authorized official, were not required to show picture identification, something all non-Gestapo people were expected to do. Beginning in 1940 the grey SS uniform was worn by Gestapo in occupied countries because agents in civilian clothes had been shot by members of the Wehrmacht thinking that they were partisans. Unlike the rest of the SS, the right-side collar patch of the RSHA was plain black without insignia, as was the uniform cuffband. A diamond-shaped black patch with "SD" in white was worn on the lower left sleeve even by SiPo men who were not actually in the SD. Sometimes this Raute was piped in white; there is some debate over whether this may or may not have indicated Gestapo personnel. Contrary to popular belief, the Gestapo was not an omnipotent agency that had agents in every nook and cranny of German society. "V-men", as undercover Gestapo agents were known, were used to infiltrate Social Democratic and Communist opposition groups, but this was the exception, not the rule. The District Office in Nuremberg , which had the responsibility for all of northern Bavaria employed a total of 80-100 informers in the years 1943-1945. The Gestapo office in Saarbrücken had at its service 50 informers in 1939. As historian Robert Gellately's analysis of the local offices established, the Gestapo was for the most part made up of bureaucrats and clerical workers who depended upon denunciations by ordinary Germans for their information. Indeed, the Gestapo was overwhelmed with denunciations and spent most of its time sorting out the credible from the less credible denunciations. Far from being an all-powerful agency that knew everything about what was happening in German society, the local offices were understaffed and overworked, struggling with the paper load caused by so many denunciations. The ratio of Gestapo officers to the population of the areas they were responsible for was extremely low; for example, for Lower Franconia, with a population of about one million in the 1930s, there was only one Gestapo office with 28 staff, half of whom were clerical workers. Before World War II, in the cities of Stettin and Frankfurt am Main , Gestapo personnel totalled 41 for both cities. The city of Hanover had only 42 Gestapo personnel, Bielefeld 18, Braunschweig 26, Bremen 44, and Dortmund 76. In Düsseldorf , the local Gestapo office, which had the responsibility for the entire Lower Rhine region, which comprised 4 million people had 281 employees. After 1939, when many Gestapo personnel were called up for war-related work, the level of overwork and understaffing at the local offices was much increased. Furthermore, for information about what was happening in German society, the Gestapo were mostly dependent upon these denunciations. 80% of all Gestapo investigations were started in response to information provided by denunciations by "ordinary" Germans; while 10% were started in response in to information provided by other branches of the German government and another 10% started in response to information that the Gestapo itself unearthed. Thus, it was ordinary Germans by their willingness to denounce one another who supplied the Gestapo with the information that determined whom the Gestapo arrested. The popular picture of the Gestapo with its spies everywhere terrorizing German society has been firmly rejected by most historians as a myth invented after the war as a cover for German society's widespread complicity in allowing the Gestapo to work. Work done by social historians such as Detlev Peukert, Robert Gellately, Reinhard Mann, Inge Marssolek, René Otto, Klaus-Michael Mallamann and Paul Gerhard, which by focusing on what the local offices were doing has shown the Gestapo's almost total dependence on denunciations from ordinary Germans, and very much discredited the older "Big Brother" picture with the Gestapo having its eyes and ears everywhere. Since autumn of 1939 Soviet secret police (NKVD) and Gestapo closely collaborated in the aftermath of the partition of Poland. Several conferences took place (see: Gestapo-NKVD Conferences). Exchanges of prisoners took place as early as December 1939. In March 1940 representatives of the NKVD and Gestapo met for the third time in the best known of these conferences which lasted for one week in Zakopane , to coordinate the pacification of resistance in Poland . The Soviet Union delivered hundreds of German and Austrian communists to the Gestapo, as unwanted foreigners, together with relevant documents. The Soviet-Nazi cooperation continued up to the German invasion of the Soviet Union in June 1941. The Polish government in exile in London during World War II received sensitive military information about Nazi Germany from agents and informants throughout Europe. After Germany conquered Poland in the autumn of 1939, Gestapo officials believed that they had neutralized Polish intelligence activities. Some of the Polish information about the movement of German police and SS units to the East during the German invasion of the Soviet Union in the autumn of 1941 was similar to information British intelligence secretly got through intercepting and decoding German police and SS messages sent by radio telegraphy. In 1942, the Gestapo discovered a cache of Polish intelligence documents in Prague and were surprised to see that Polish agents and informants had been gathering detailed military information and smuggling it out to London, via Budapest and Istanbul . The Poles identified and tracked German military trains to the Eastern front and identified four Ordnungspolizei ("order police") battalions sent to conquered areas of the Soviet Union in October 1941 and engaged in war crimes and mass murder. Polish agents also gathered detailed information about the morale of German soldiers in the East. After uncovering a sample of the information the Poles had reported, Gestapo officials concluded that Polish intelligence activity represented a very serious danger to Germany. As late as June 6, 1944, Heinrich Müller, concerned about the leakage of information to the Allies, set up a special unit called Sonderkommando Jerzy that was meant to root out the Polish intelligence network in western and southwestern Europe. OVRA - Fascist Italy's civilian intelligence service. Lumsden, Robin. A Collector's Guide To: The Allgemeine - SS, p 83. Lumsden, Robin. A Collector's Guide To: The Allgemeine - SS, pp 80-84. Williams, Max. Reinhard Heydrich: The Biography: Volumes 1. 2003, page 61. Williams, Max. Reinhard Heydrich: The Biography: Volumes 1. 2003, page 77. Padfield, Peter (1990). Himmler: Reichsfuhrer-SS. New York: Henry Holt and Company. Williams, Max (2003). Reinhard Heydrich: The Biography: Volumes 1, Ulric Publishing, ISBN 0-9537577-5-7. Editors of Time-Life Books (1988). The SS: The Third Reich Series. Alexandria, Va.: Time-Life Books.